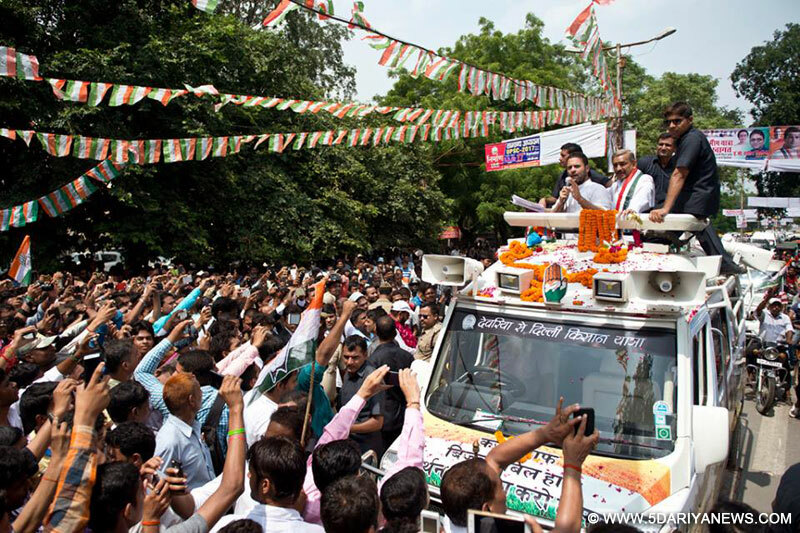 A huge turnout at Rahul Gandhi's ongoing Kisan Yatra brought smiles on the faces of Congressmen on Thursday.Thousands lined up on the roadsides to catch a glimpse of the Gandhi scion, who spent Wednesday night at Anand Bhawan, the ancestral home of the Nehru-Gandhi family.The Congress leader earlier started the road show after garlanding a statue of Chandrashekhar Azad. After this he went to Swaraj Bhawan where overzealous party workers and supporters raised slogans in favour of the Congress party. He was similarly greeted at Katra where people jostled with each other to shake hands with Gandhi.The entourage then left for the Hindi hostel after which it reached the fore brigade square. Rahul Gandhi is later scheduled to garland the statue of former UP Chief Minister Hemwati Nandan Bahugun and address a public rally at Chowk.He will also hold the 'khaat chaupal' in the Manjhanpur state assembly constituency in Kaushambi district and leave for Chitrakoot later in the evening.